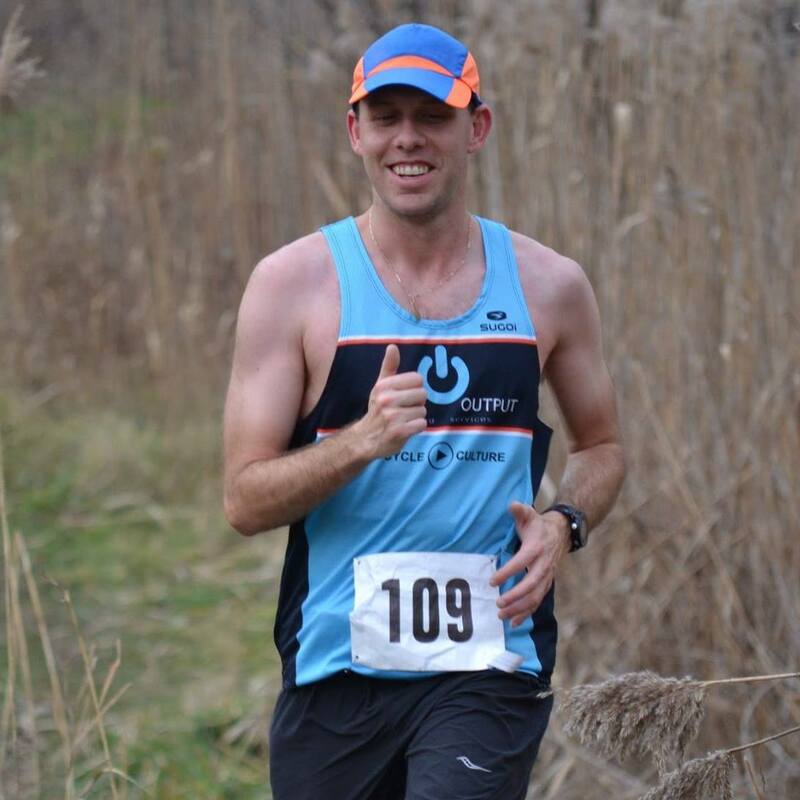 Jason "Chaser" Chiasson is 36 year old run specialist that joined us at INPUT OUTPUT at the beginning of 2015. He began the year with a solid race resume of 1/2 marathons and below, and has used his racing as his way of seeing the world, racing in such places as Florida, Scotland, The Yukon, and currently training for the Volkswagen Prague Marathon in May. Jason is able to do what few of us are able to; he is able to tax his body day after day with a high mileage program without breaking down. He attributes a lot of his ability to recover and work hard day after day to his modest weekly workload increase, as well as maintaining a cross training program that consists of some light cycling, swimming, and following many hard workouts with a short routine of "runner's yoga." On April 3rd, Jason opened up his racing season at the Around the Bay road race, accomplishing there once again what VERY few runners are able to do (and if you've run this race, you will agree with me). He had descending 10km splits throughout the race. Jason was able to negative split the 30km by about 90 seconds, and set a 1/2 marathon PB en route to his finish, shedding about 8 minutes from his current PB set in 2015 after taking 10 minutes off his PB in that race. Detroit International Marathon. I thought the opportunity to run on the ambassador bridge, and in the Detroit/Windsor tunnel was cool. What are your serious running goals? My long term running goal is to qualify for the world series version of our sport which is the Boston Marathon. Why do you run? And, what do you enjoy most about running? I run because it is fun. It is fun for me because I get to explore new areas that I would only briefly see if I was driving. I also get a level of satisfaction when I run a long distance. I am able to say "Wow, I ran that far!?" I enjoy running because it is a sport where the true competition is really against yourself. Even though there is definitely some joy in going out and competing with friends, to me it is more satisfying when I am able to complete a PB (personal best) time or distance. Jason is currently training for the Volkswagen Prague Marathon on May 8th in the Czech Republic where he is sure to destroy his PB, but at the very least, have a some fun "exploring the scenery." Good Luck Jason!